Damsel Fly in Purple Still Works in 2017! Several years ago while fishing a local pond, a COAF Team Member noticed Largemouth Bass bedding in the shallows. After several attempts at getting one to strike a fishing fly, one Bass went for a Wooley Bugger as it passed its spawning bed. Trying for another Bass resulted in a Bass showing interest, but before it decided to strike, the fishing fly snagged bottom and was lost. Out of Wooley Buggers, the COAF Team Member checked his fly box and looked for another fishing fly. Preferably, one that would not snag bottom. 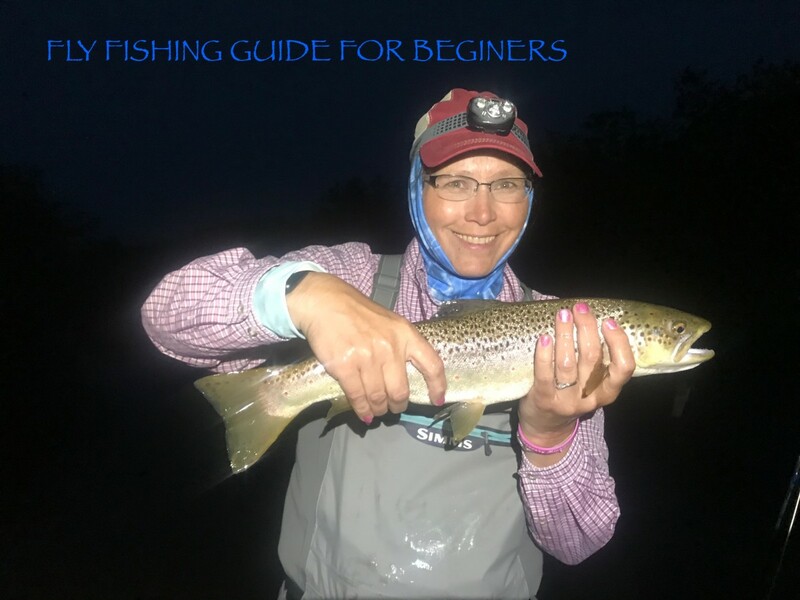 A quick look in the fly box came up with a Damsel Fly that was purchased earlier in the week from a local sporting goods store by chance. It was on sale at half-price, had a bead chain head to weight the fly so it tended to ride hook bend up, and was olive in color matching the little bait fish in the pond. In a few casts, the Damsel Fly was doing its job, catching fish! Better yet, it did not hang bottom at least not as often as the Wooley Bugger. Later that evening, the COAF Team Member decided to make a few modifications to improve on the original pattern. What resulted is a variant that the Team called the COAF Damsel Fly! 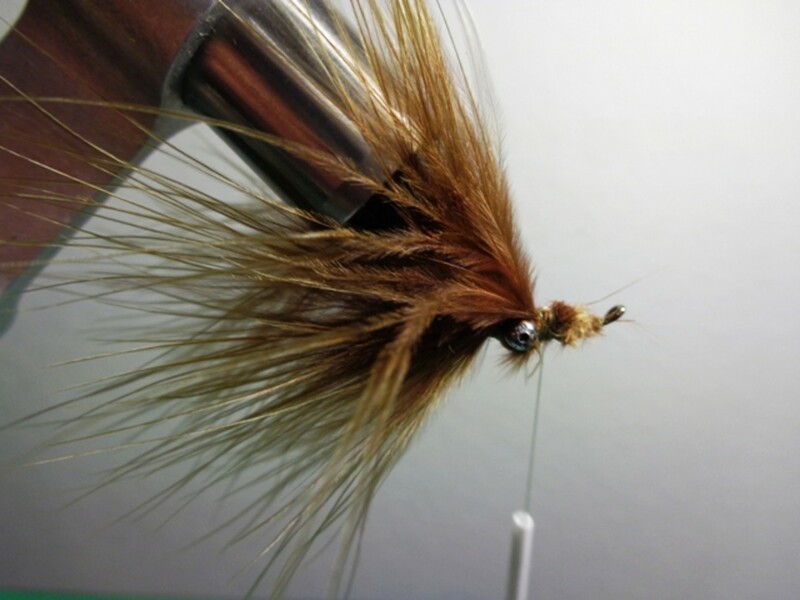 The COAF Damsel Fly is a simple but effective pattern that uses material readily available and best of all, it catches fish without snagging bottom (at least not as often when compared to patterns that ride with their hook bend down). 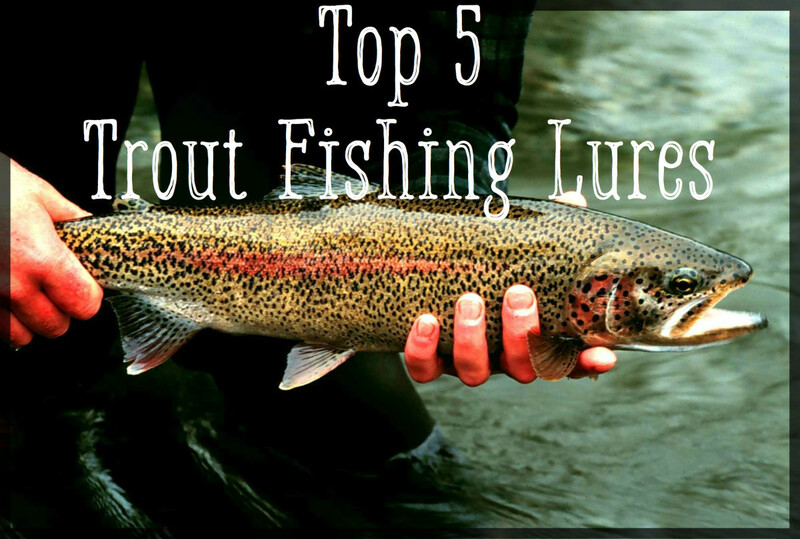 Do give this one a try and as always,... Good luck and good fishing! 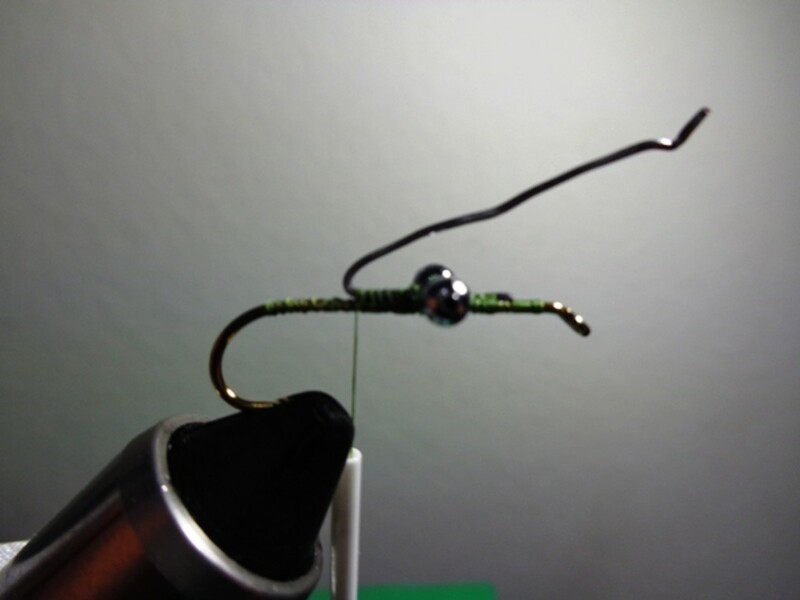 Stop about one bead chain length from the hook eye. 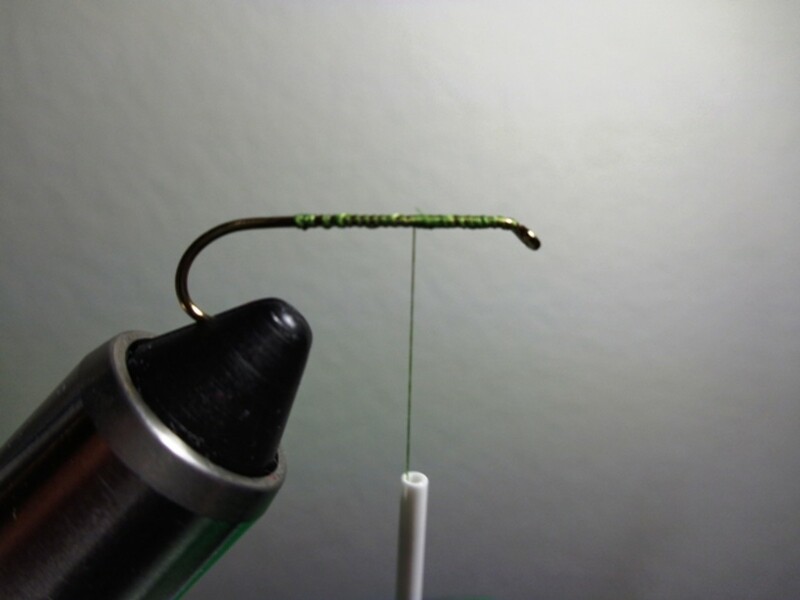 Lay a thread base along the Size 8 Streamer Hook. Stop wrapping the thread about one Bead Chain length from the hook eye. 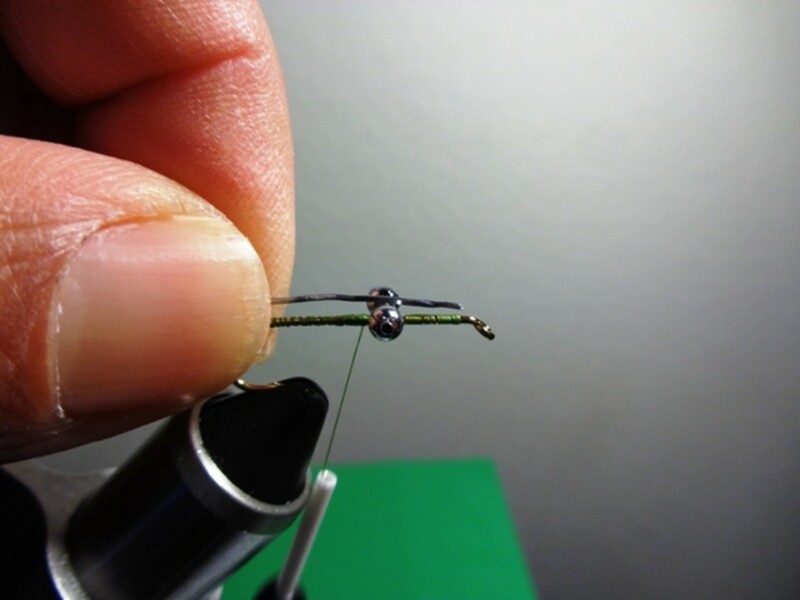 Next, secure the Bead Chain using a "Figure 8" wrap. Once in place, apply Zap-A-Gap (or Super Glue). And then, let it dry before proceeding. 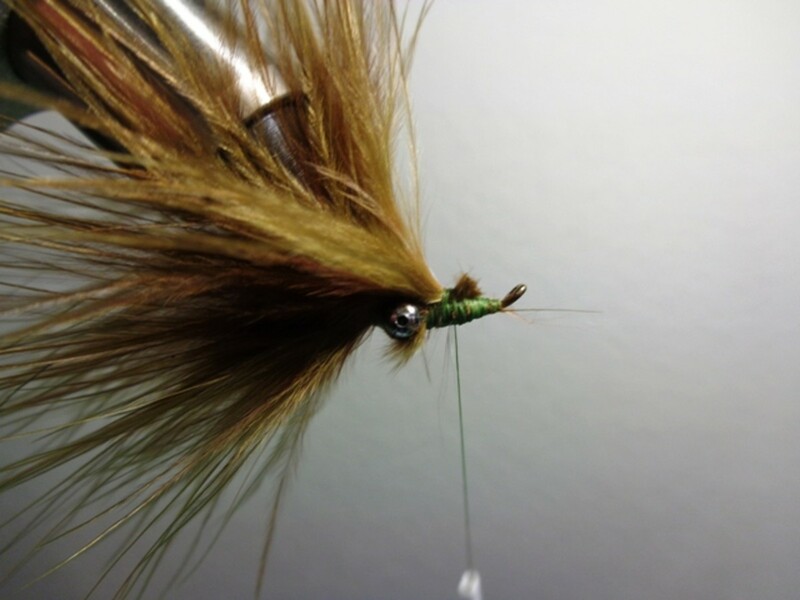 Note: If the weighted version of the COAF Damsel Fly is desired, proceed to Step 2a, else go to Step 3. First wrap completed, lead wire being re-positioned. Break off about 1-1/2" of Lead Wire and then position it on to the hook so it rests top of the hook shank as shown in the picture in the sidebar. Be sure the wire extends past the Bead Chain by about 1/4" forward of the Bead Chain. Next, secure the Lead Wire to the hook shank. 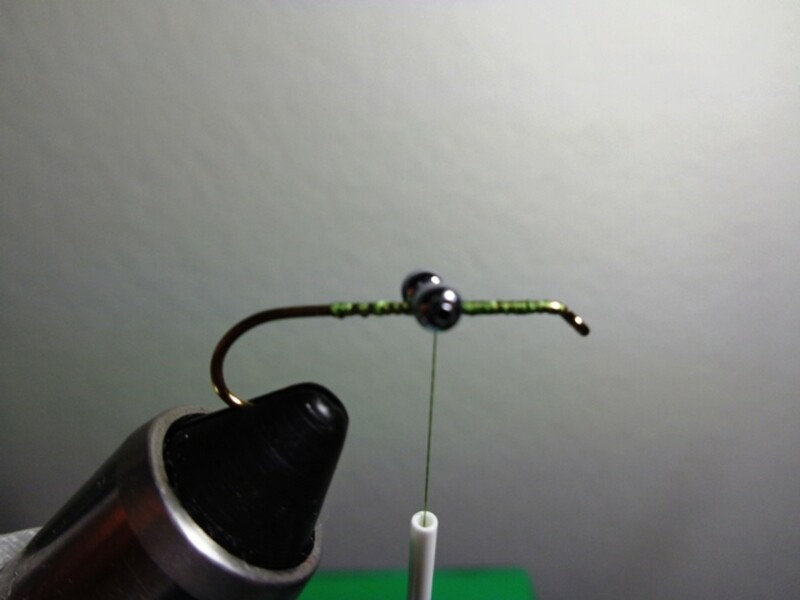 When wrapping towards the hook eye, extend past the Lead Wire for several wraps, and then, reverse direction and being wrapping toward the hook bend, stopping about a 1/4" past the Bead Chain. At this point, re-position the Lead Wire by bending it forward as noted in the next picture in the sidebar (click on the thumbnail to view it). Then, secure the Lead Wire in place like you did with the first wrap but this time, stop about an 1/8" past the Bead Chain. Once secured, re-position the Lead Wire again but this time bend it backward and lay it flat against the hook shank as noted in the next picture in the sidebar, If the lead wire extends past the point where the hook bend starts, trim off the excess. Next, secure the Lead Wire using multiple wraps along its length. 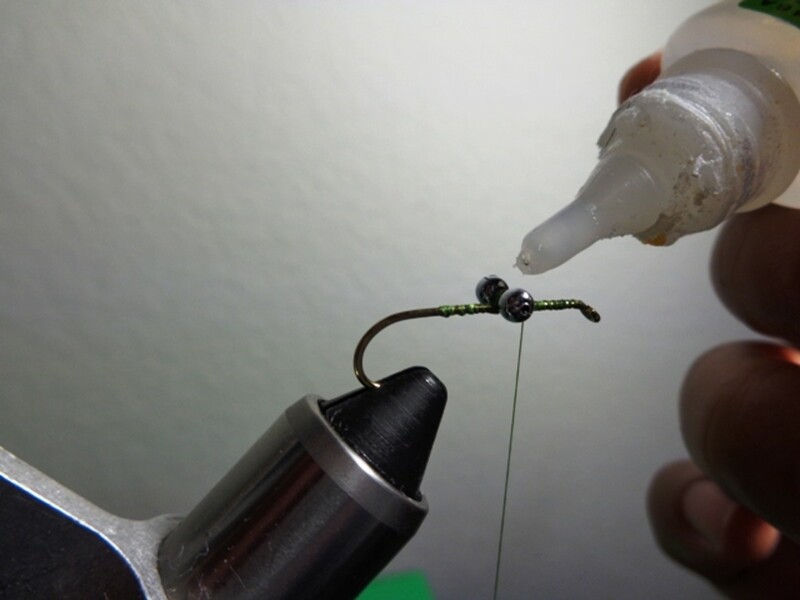 Be sure it stays on top of the hook shank, and once secured in place, stop the thread just forward of the Bead Chain. (picture in the sidebar shows the thread behind the Bead Chain, it should be in front of it). Finally, apply Zap-A-Gap (or Super Glue) and let it dry. Once dry, proceed to Step 3. For a better understanding of this step, click-on the thumbnails in sequence before attempting. 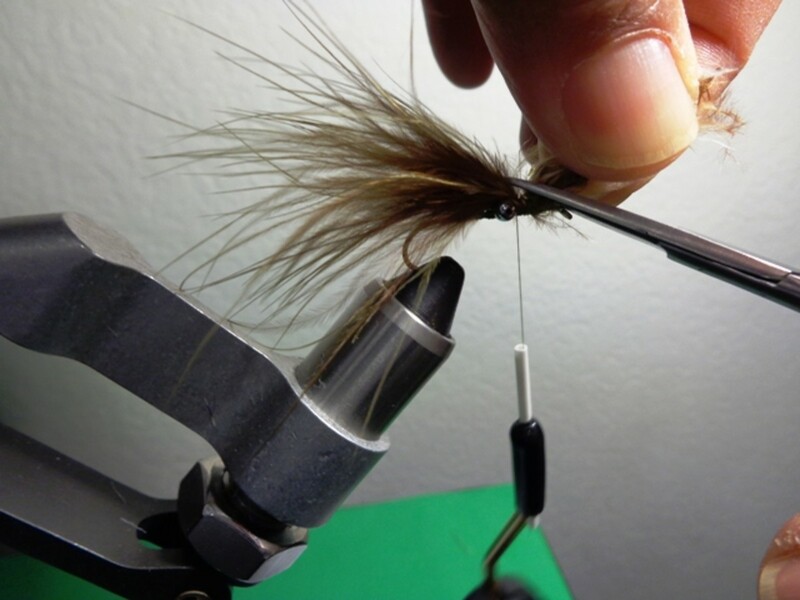 Position the Marabou on the top of the hook shank and adjust the position by moving the Marabou forward until the desired length of the fishing fly is attained. For our area, we usually extend it about a hook length past the hook bend. Next, secure the Marabou with several wraps, and then trim the excess. Make several more wraps just forward of the Bead Chain, and then make several wraps behind the Bead Chain. Refer to the pictures in the sidebar for a better understanding of this step. 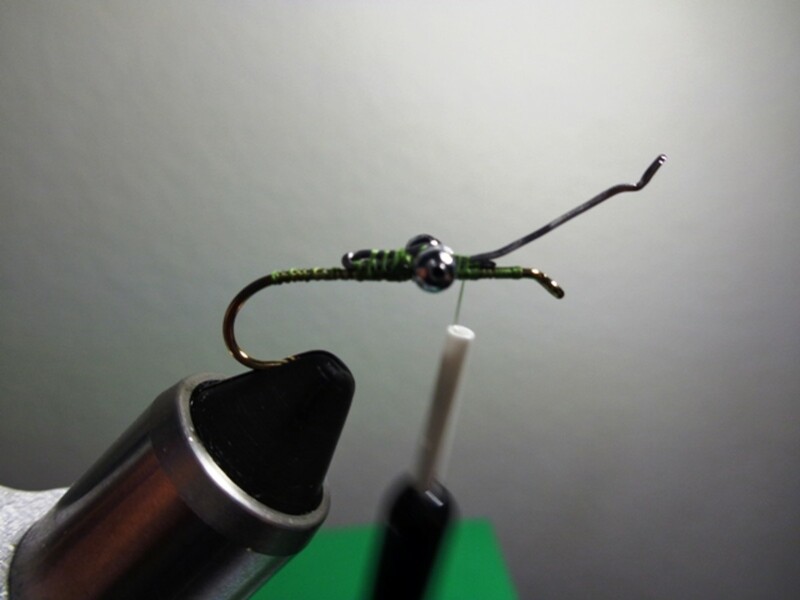 If using a rotary vise, rotate the vise so the fishing fly's hook bend rides up as noted in the picture in the sidebar. If using a non-rotary vise, do the same by removing the fishing fly from the vise, flipping it over, and re-clamping it to the vise. 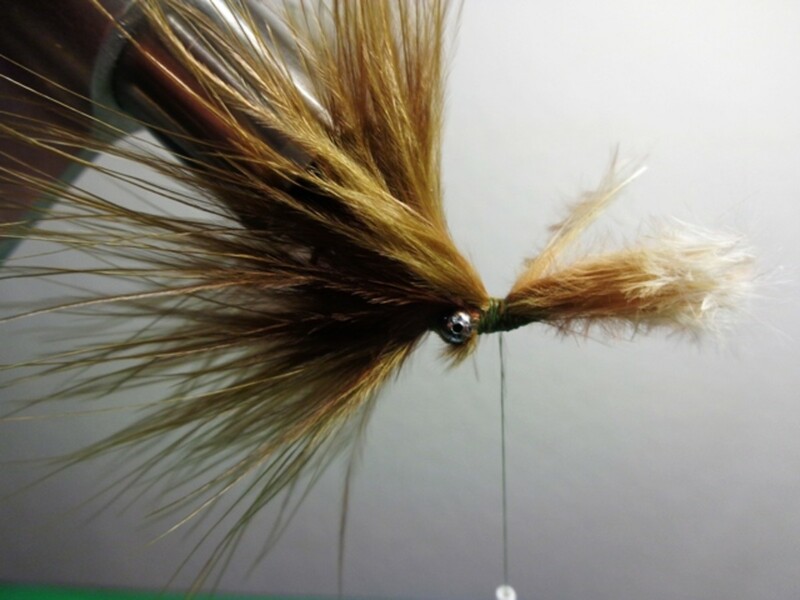 Next, make a wrap just forward of the Bead Chain, and then position the Marabou on the top of the hook shank. 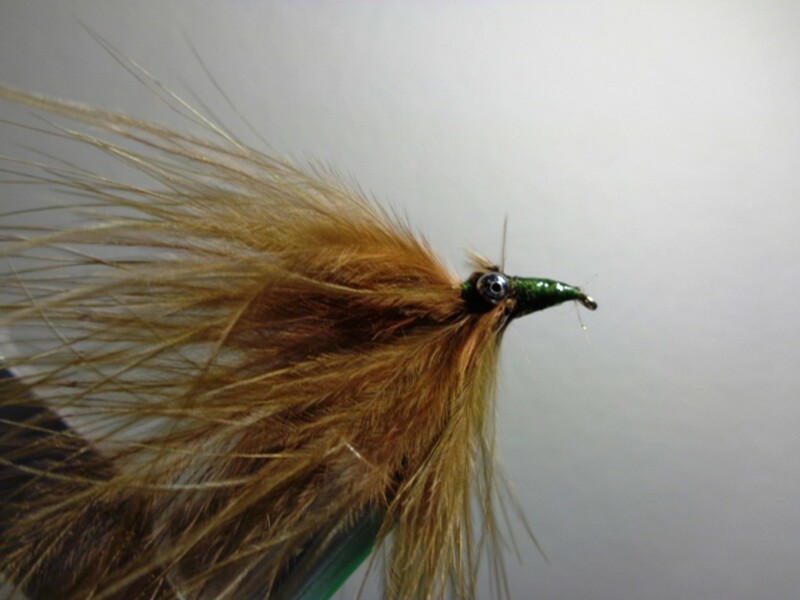 Adjust its position by moving the Marabou forward/backward until it is about the same length as the first Marabou. Next, secure the Marabou with several wraps, making sure it is secured ahead of the Bead Chain, and then trim the excess. Make several more wraps to ensure it is secured in place, and then proceed to Step 5. Step 5 - Final Step! 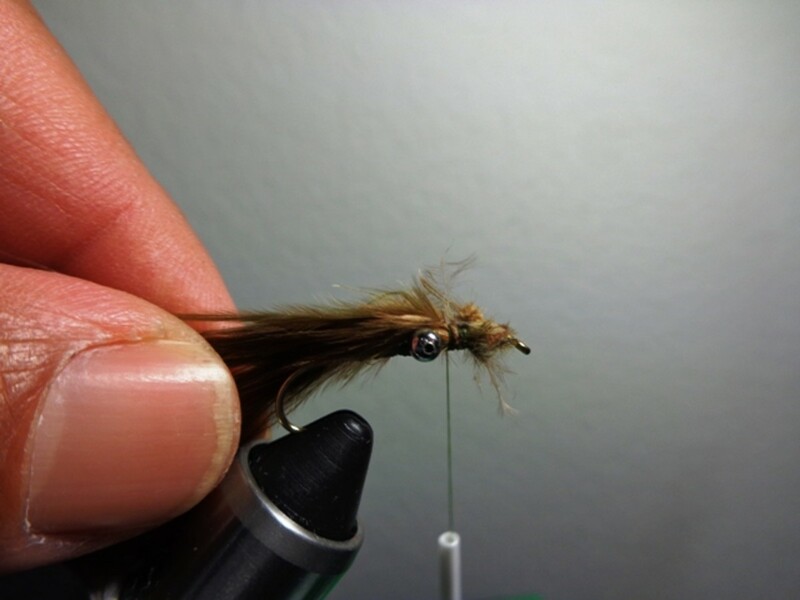 Position the Marabou on the top of the hook shank, adjust its position by moving the Marabou forward/backward until it is about the 1/4 shorter then the other two Marabou plumes. 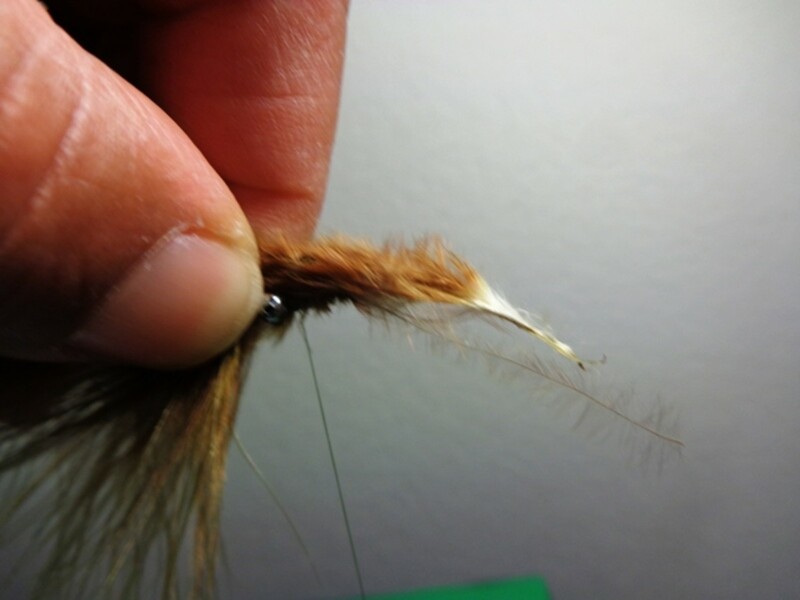 Next, secure the Marabou with several wraps, making sure it is secured ahead of the Bead Chain and ahead of the second Marabou, and then trim the excess. 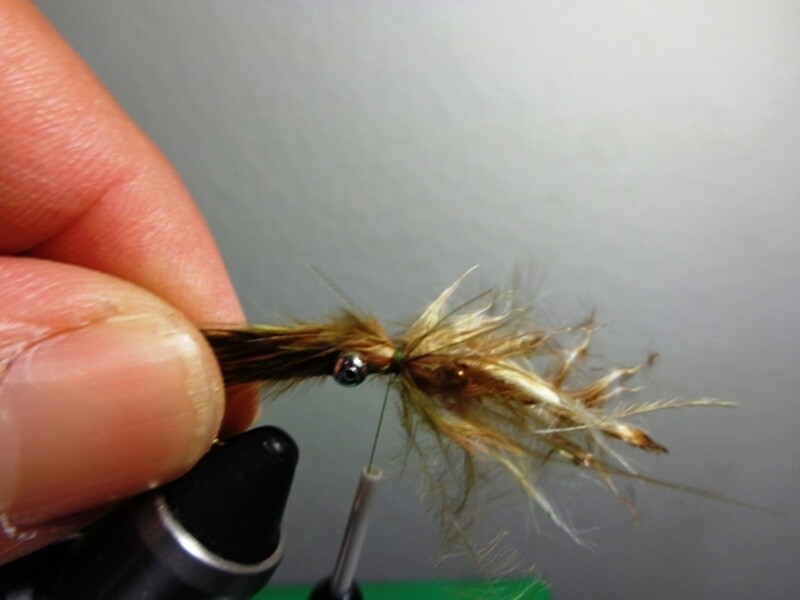 Make several more wraps to ensure it is secured in place, and then begin forming the fishing fly's head using the tying thread. 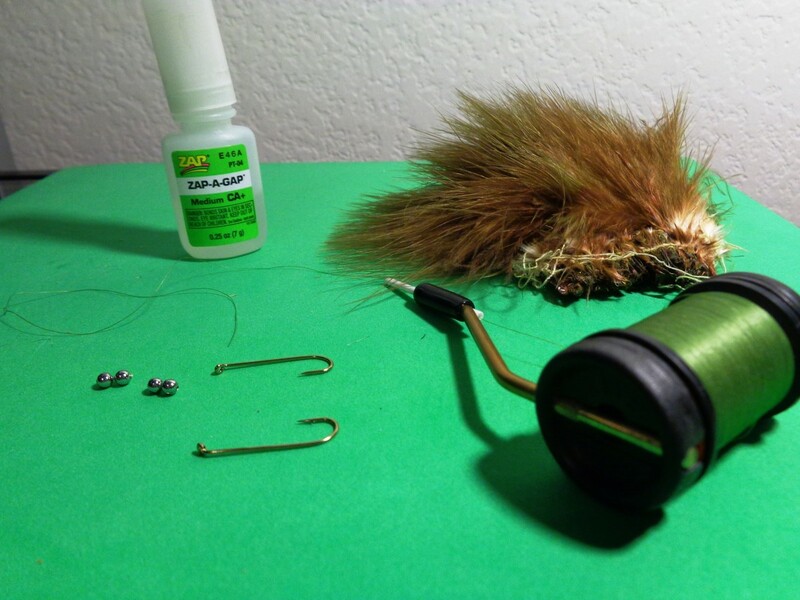 Once the head is formed, whip finish and apply Zap-A-Gap (or Super Glue or Head Cement) to finish the fishing fly. Once the glue is dry, it is ready to be fished! 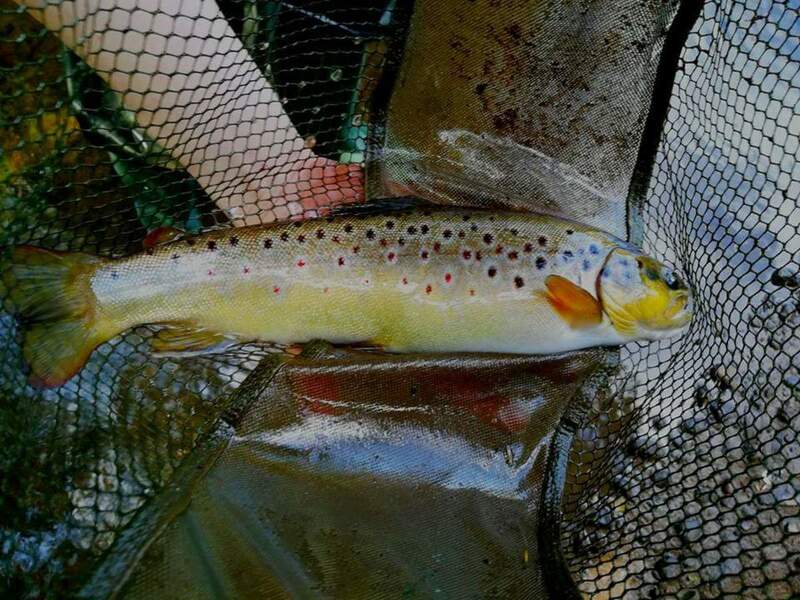 When fishing the COAF Damsel Fly, here are a few suggestions from the COAF Field Team! After casting, let the fishing fly sink to the bottom. As it sinks, pay close attention for any sign of a strike, and be prepared to set the hook. 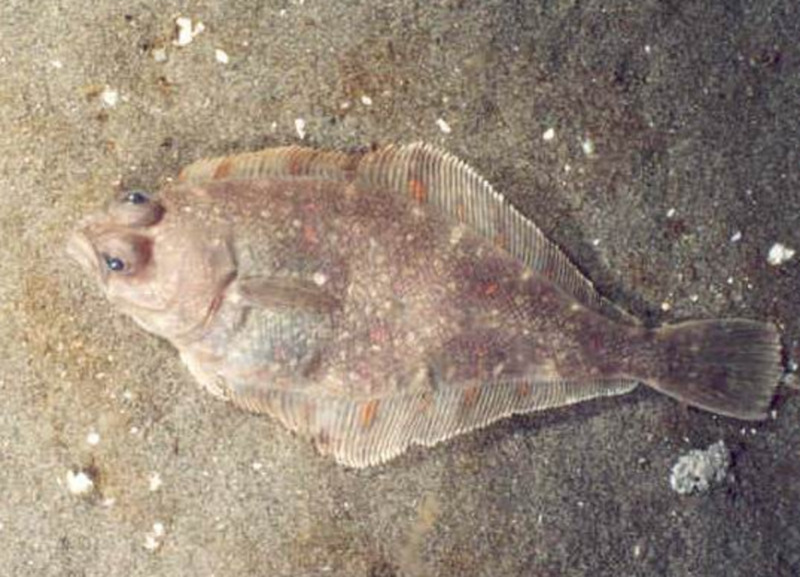 Use short, snappy jerks to simulate a darting bait fish or a crawdad skittering along the bottom. 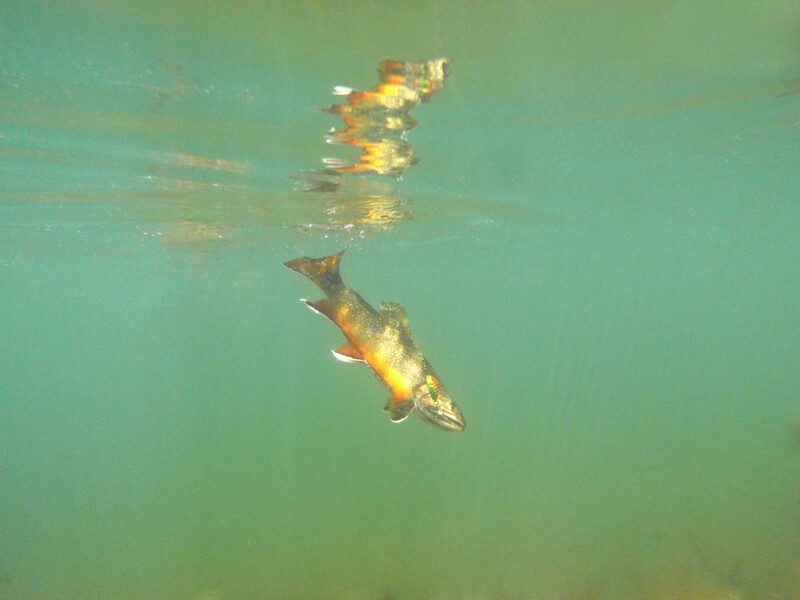 When fishing spawning beds for Bass, work the lure through the bed slowly. 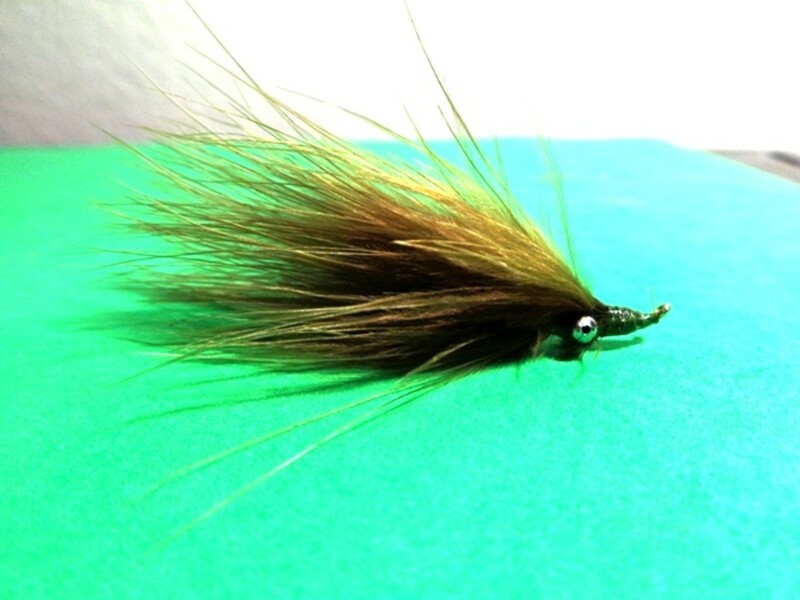 Be prepared for the Bass to inhale the fishing fly and quickly spit it out! 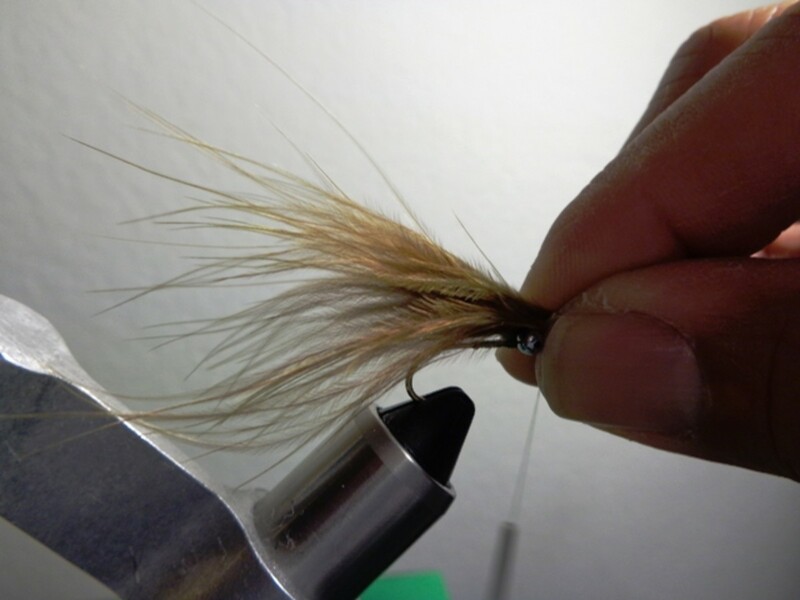 Be sure to match the hatch and adjust the size of the COAF Damsel Fly to match the bait fish in your area. 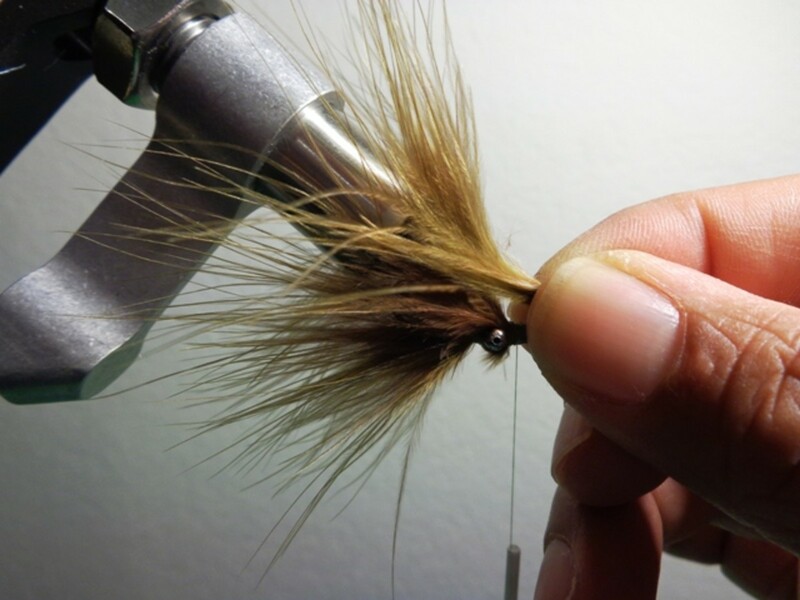 PS: Do check out the videos below for an idea how we fish the COAF Damsel Fly. Also, there is one more variant of the COAF Damsel Fly called a Bouncer in one of the video clips below. 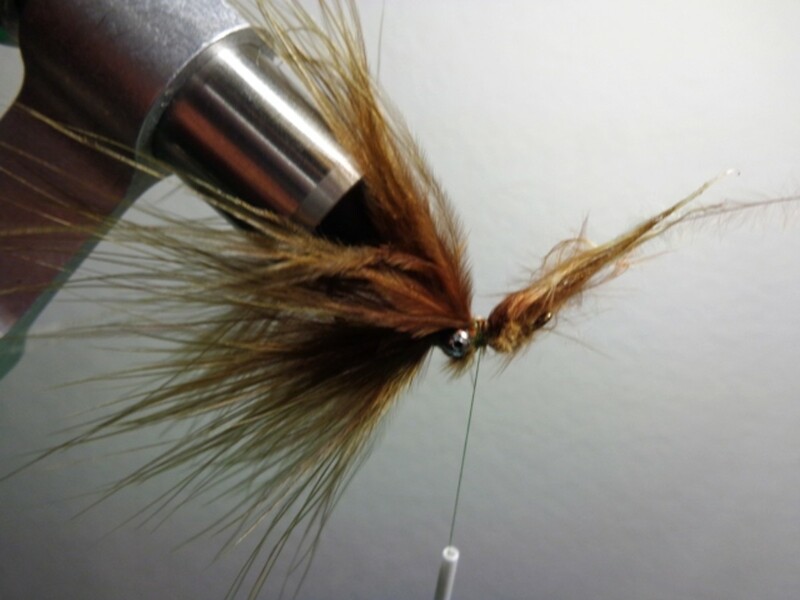 It uses beads strung onto a piece of monofilament line, and then secured to the hook so the hook bend rides higher up when resting on the bottom! Bite Was On at Bethany... Damsel Flies! Damsel Flies and one other Fly! A Variant of the COAF Damsel Fly... Bouncer! What color Damsel Fly works best for you? Size 10 COAF Damsel Fly in Purple! 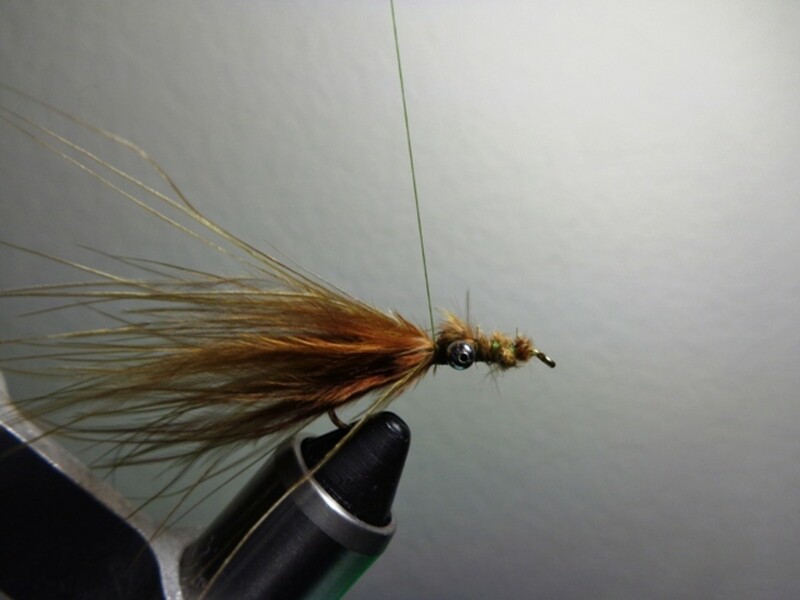 This fishing fly remains a favorite with the Team. 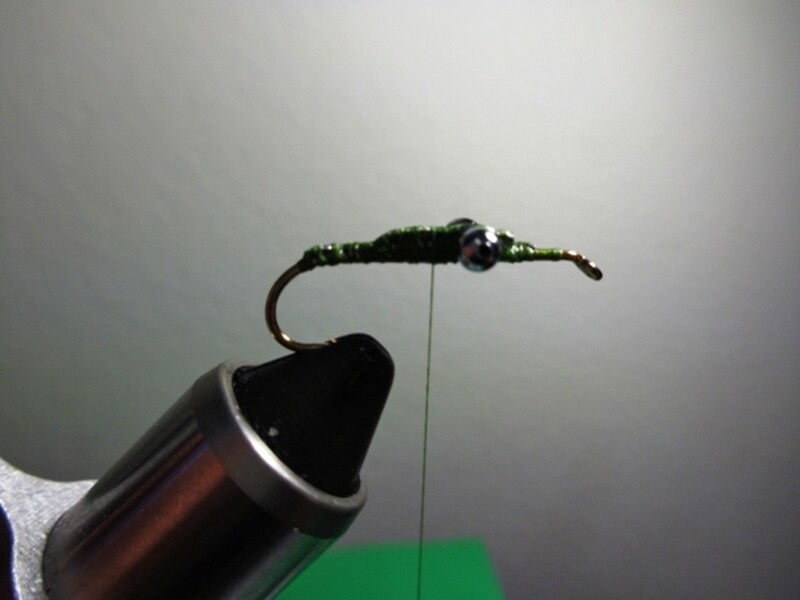 Scaled down to a size 14 or 16 add the Micro Fly Rod and you are ready for some great action while Micro Fishing! 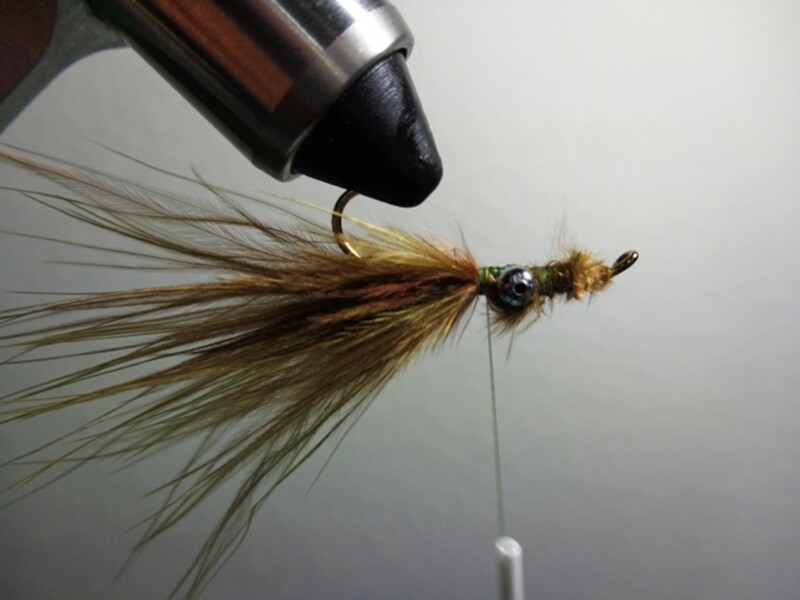 Mixed things up this time and tied a COAF Damsel Fly in Purple Marabou and Red Dacron Tying Thread. 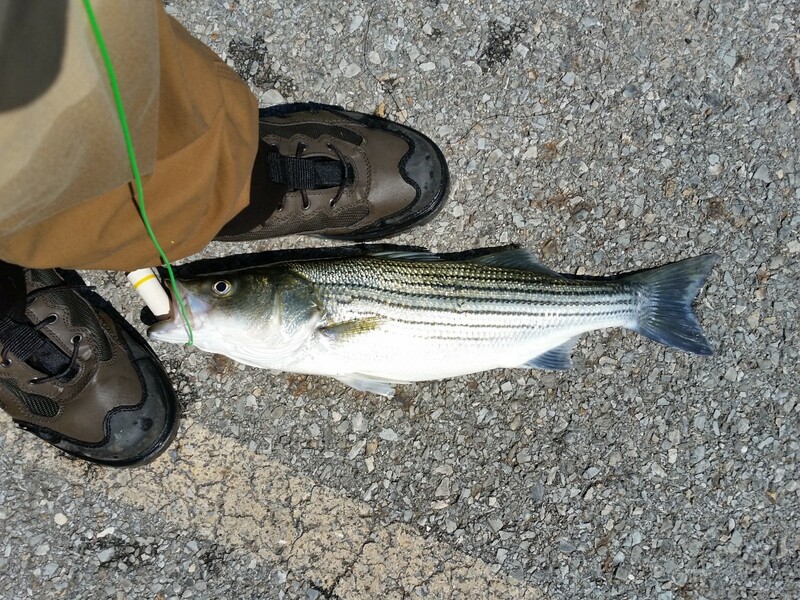 Worked well today except lost a big one when the line broke. 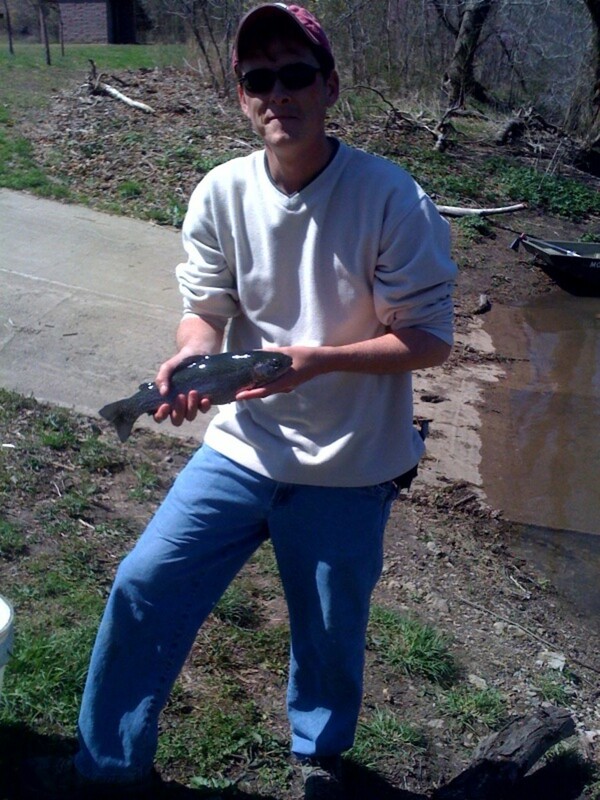 Did get a nice Catfish and several Bass; also caught one with a COAF San Juan Worm Ball! 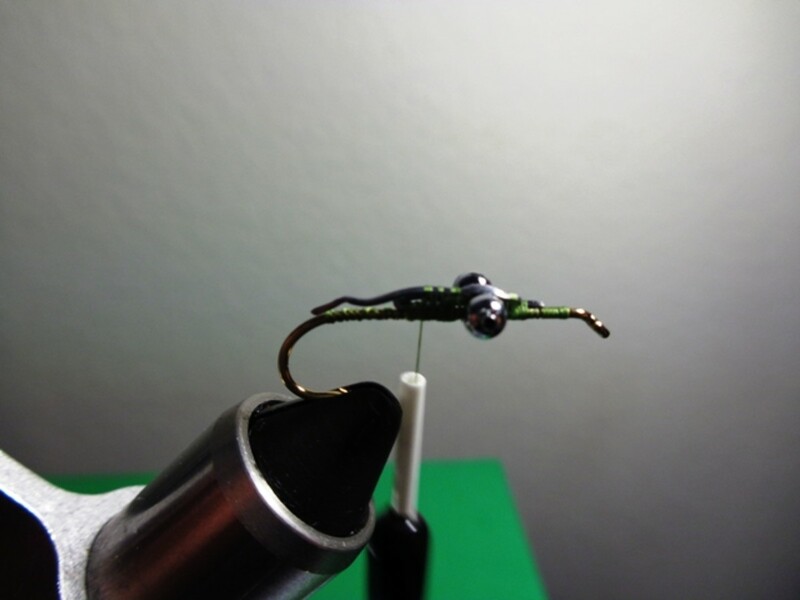 Check out the video in this article's section titled "Size 10 COAF Damsel Fly in Purple!" At least got some video of the action before losing the big one... almost took the line to the backing! Excellent info and great demos. Well done. Added a video of a COAF Damsel Fly in Size 12; for some reason, the fish wanted the smaller fishing fly. 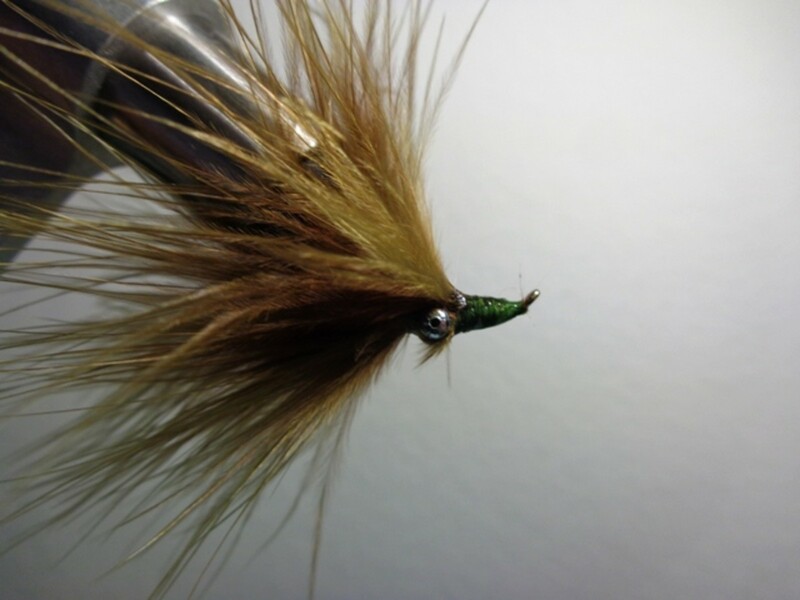 Here is another fishing fly we hope our Readers find useful. Works well this time of year when Bass are spawning in their beds!